Turn any darkened room into a theater for the wonders of space. Project hundreds of stars, planets, and constellations with all their names on the walls and ceiling against a realistic 360° city skyline. Accurate to the season, month, day, and hour for any time period. The one-piece acrylic projection sphere is detachable from the base and has glow in the dark stars for use as an outdoor star guide. A luminescent compass provides quick starfield orientation. An entertaining 50-minute audio tour is included along with an illustrated activity guide. 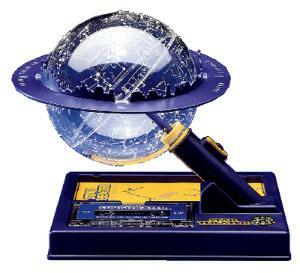 The activity guide shows the planet positions through the year 2001. Halogen bulb included. Uses two AA batteries (not included).